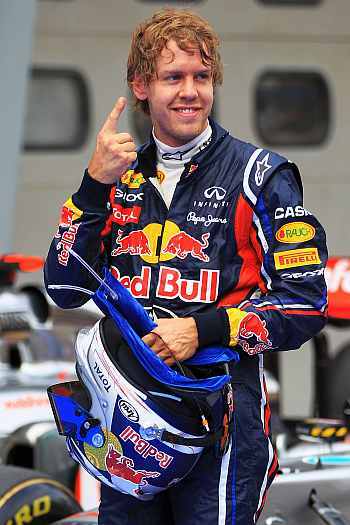 Sebastian Vettel has vowed to win the Formula One title in style even though he need finish only 10th in Sunday's Japanese Grand Prix to be sure of becoming the sport's youngest double champion. The winner of nine of 14 races this season told reporters he intended to kick off his celebrations on the podium at Suzuka, rather than simply bank the solitary point he needs from the final five grands prix. "We want to do it in the right way," said Red Bull's 24-year-old German, winner from pole position at the Honda-owned circuit for the past two years. "I think if you have the ability, the package overall, to do well around here, you have to enjoy it and you have to make sure that if the chance is there to finish on the podium you finish on the podium," he added. "Yes, there would be reason to celebrate, even if we finish 10th, but it wouldn't be the same. "So we try to race as usual and we try to get the best out of ourselves." 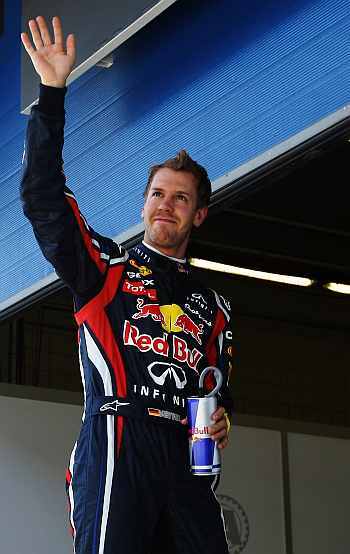 The only driver who can prevent Vettel from becoming only the ninth back-to-back world champion on Sunday is McLaren's Jenson Button and to do that he would have to win at Suzuka while the German must fail to score for the first time in 17 races going back to last October. Button did not think that was remotely likely but still enjoyed the pretence that he remained a threat to Vettel's dreams. Vettel, sitting next to the 2009 world champion in a news conference, had pointed out that there was "still a chance for Jenson to win the title and for me not to". Refusing to take anything for granted, the German stuck to his familiar mantra of keeping his feet on the ground, facing each race at a time. 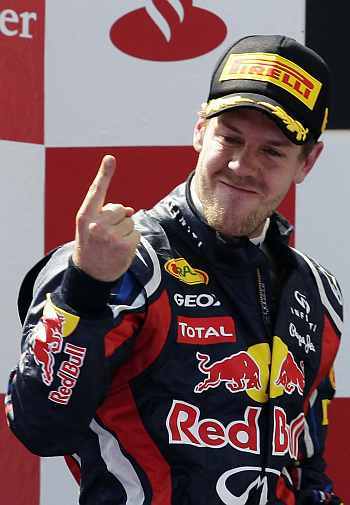 "The moment you decide to fly, sooner or later there's a moment when you will come down as well," Vettel warned. "You have to, nothing flies for ever." He also laughingly suggested that if anyone wanted to do him a favour, they could maybe push Button down the stairs on the way out. Button gazed around the room and doubted any of those present shared Vettel's apparent concern. 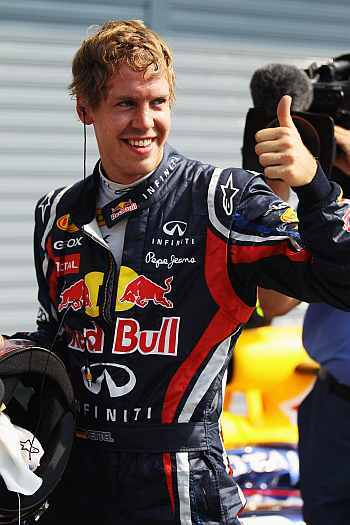 "I think it's great, going into this race, Sebastian thinking that I have a chance of winning the title," he grinned. "He's probably the only person here (who does)...or the only person that's saying so. Red Bull team boss Christian Horner acknowledged that was effectively the case but said the team would not be behaving any differently. "I think with Sebastian, obviously we'd have to try quite hard for him to lose it now," he conceded. "But nothing is done, never count chickens until they are hatched." Asked whether the Vettel 2011 championship T-shirts were ready and waiting for Sunday afternoon, Horner smiled and swerved. "I haven't been involved with any T-shirts, caps, banners of any sort," he said. Meanwhile, Jenson Button refused to rule out a further twist to his Formula One career on Thursday despite McLaren announcing a lucrative new contract that could keep the 2009 champion at the team for years to come. Asked at the Japanese Grand Prix whether the 'multi-year' deal announced by the team meant he would now see out his career at McLaren, the 31-year-old driver told Reuters: "Not necessarily. "I've been asked 'Is this my last contract?' and probably two years ago I would have said definitely," the Briton added. "Even last year I probably would have said definitely. "But time flies and I think it (the decision to retire) will end up going back and back. So yes, it might be or it might not be. I don't know." 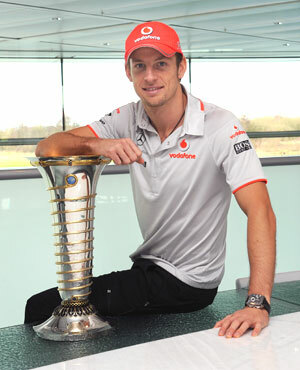 Button, who joined McLaren after winning his title with Brawn GP, said his experience with the team over the last two years meant his retirement was now further away than might otherwise have been the case.